Players compete to build the best resort for attracting fantasy heroes and tourists looking for fun and relaxation. The more you attract, the more likely monsters will attack! Hire and train your workers, build and upgrade your attractions, and convince your battle weary heroes to fight just one more time so without letting too many tourists get eaten! Gain Victory points by upgrading attractions and giving Heroes the rest they need. The highest scoring player when all monsters are defeated is the winner. Each player begins with a humble resort consisting of a Beach, a Tiki Hut and a small number of Tourists, placed at each attraction. Each player starts with their own worker Deck consisting of 7 Apprentices, 3 Street Performers, and 3 Lazy Peons. Each Player draws a hand of 5 Workers from their Worker Deck. Players simultaneously send worker cards from their hand to do work at each of their Attractions. Any missing units of work (are required by the Attraction) cause Tourists to leave before gathering resources. Players gain the primary resource of Gold by having more tourists at each attraction, and Flair by having less tourists. Attract Tourists from the Dock (Spending Flair) - Tourists are placed at attractions, potentially increasing the Gold gained on the subsequent turn. Attract a Hero from the Dock (Spending Flair) - Heroes start with low health, which is gained at the end of each round. Fully Rested Heroes are scored for Victory Points. Upgrade an Attraction (Spending Gold) - Providing higher tourist capacity, better Gold payout, better abilities and more Victory Points. Upgraded attractions typically require more workers to keep them fully staffed. Train or Hire new Workers (Spending Gold) - Upgrade your workers to provide more work, or better abilities. Training locks a worker draft pile, preventing other players from upgrading to that particular worker during the round. Training workers is a 1-for-1 exchange, keeping players' Worker Deck lean by design. Any time during a player's turn, he may use abilities from fully-staffed attractions, or discard worker cards to use their unique abilities. The dock is refilled with new Heroes and Tourists from a center pile. While refilling, it's possible to trigger a Monster Attack! If an Attack! card is revealed, the top Monster from the Monster Pile will choose which player it's attacking; typically by Most Tourists or Most Heroes at their resort, ties broken clockwise from the start player. If a Hero defends against a Monster Attack, he loses 1 health. Any undefended damage causes tourists to be eaten by the Monster. Heroes may dodge into, or out of, a Monster Attack up to one time per round. If an attraction has no Hero or Tourists, a Monster will Damage it, potentially destroying the attraction. A player may chose (if they have one) to throw a Lazy Peon at the monster, ending the attack and permenantly removing the Worker Card from the game. The Dock Continues to refill, potentially triggering more Monster Attacks, until it is full. Used and unused Workers are placed in players' discard piles. Any fully-rested Heroes are scored - Placed to the side, each worth Victory Points at the end of the game. This Hero also removes the top Monster from the remaining Monster Deck. Remaining Heroes gain 1 Health each. Any Locked Worker Draft Piles and Attraction Abilities are made available for the next round. Any unused Flair is sent back to the supply. Gold carries over to the next round. If at the end of the round there are no Monsters remaining, the game is over and players total Victory Points from Attractions, Scored Heroes, and 1 point for each remaining Hero at their resort. 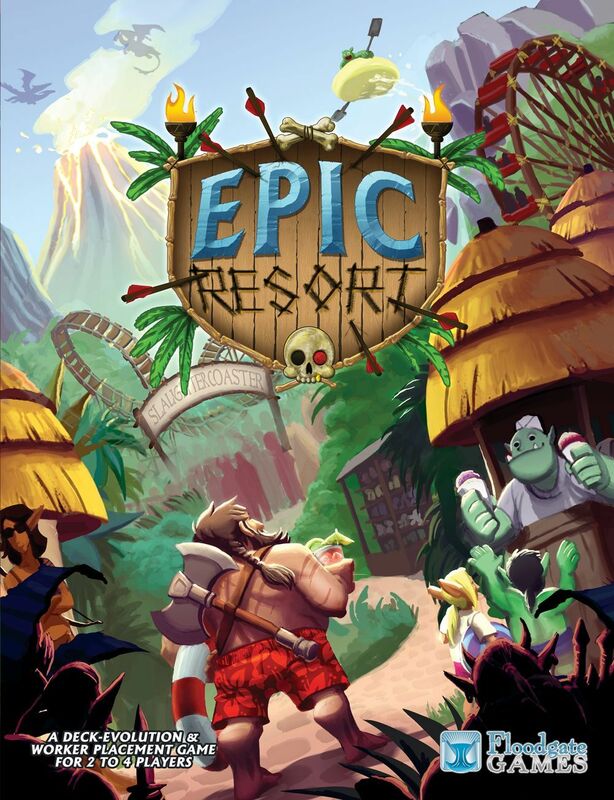 The player with the highest Victory Point total has built the most Epic Resort and is victorious!